Designed for use with the Bosch L-Boxx-2 carrying case, which is part of the Bosch Click and GO mobile-transport system. 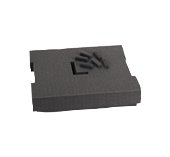 This Bosch foam-201 pre-cut foam insert provides added versatility and convenience. The insert features customizable foam pieces which push/pull out to accommodate Bosch or any other tools. Users can make completely customized tool inserts using this foam. This foam helps to keep valuable equipment safe and protected during transport or storage.